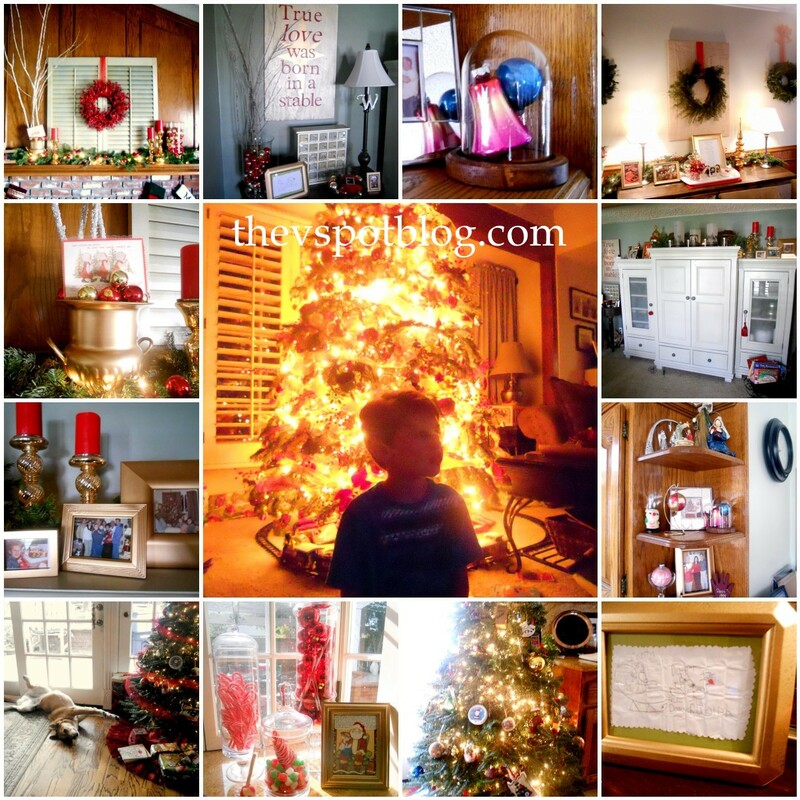 Our home’s Christmas decor… better late than never. The month of December has just flown by! I haven’t had time to do all of the things I wanted to, but at the same time, I’m not stressed out at all. 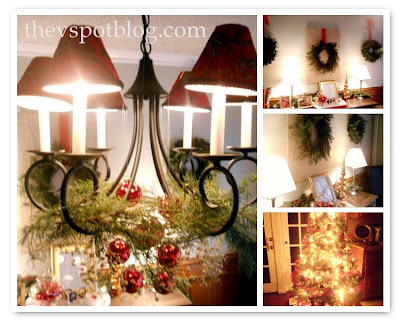 Anyhow, I didn’t link up to any holiday “home tours” but here’s what’s going on in our household. 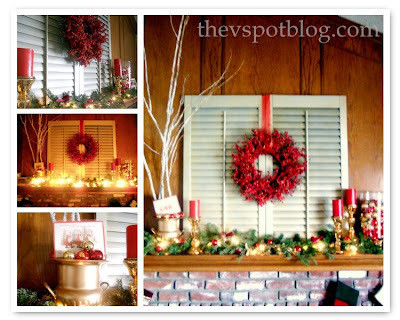 Although I usually change things up with fun colors each year, I promised Handsome Hubby that this year would be traditional Christmas colors… so Red, Green & Gold it is. Special touches… Ornaments from my parents’ Christmas tree, about two weeks after they got married. These ornaments are 51 years old and I treasure them. And this? 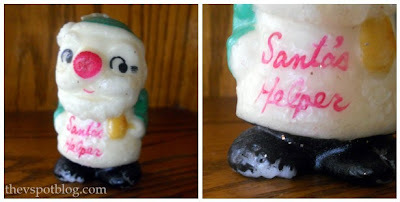 This candle says Santa’s Helper, but I think Christmas Troll would be apropos. What the heck is that?! It’s a little scary. However, when I was about 18 months old I must have thought it looked more tasty than scary. Those little marks on the shoe are where I nibbled on it a little bit. Merry, merry Christmas and blessings for 2012. Merry Christmas Vivienne! Love the tree… And what’s with some of those “vintage” holiday decorations that we all have, that come out year after year? A lot of them were a little more scary than cute. But we still love them! Ahhh… the memories and traditions. That’s what Christmas is all about. Have a wonderful holiday with your family and friends this weekend! Gorgeous like always. I expect nothing less. Looks beautiful! Love love that shot of your tree. And how awesome to have one of your parents first ornaments. Christmas night in a whirlybird. The whirlybird’s gonna land on your roof! I hope this Christmas is full of blessing for you and your gorgeous family of boys. Love the sign “True Love was born in a stable.” Did you DIY it? Everything is beautiful. 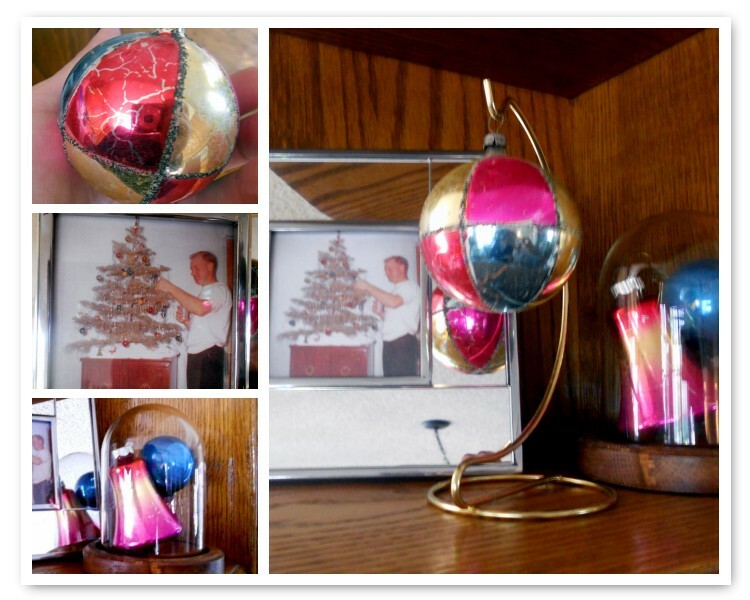 My favorite would have to be the vintage ornaments that were your parents and the photo. Priceless! Fun getting to look at your decorations. 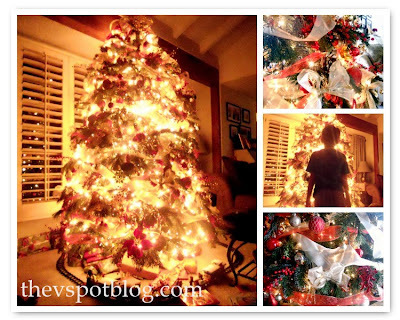 Your tree is just beautiful! It looks great. Every time I walk past store windows of Christmas decoration stores in Toronto and see all those amazing colors, I try to imagine how it would look like in my house. However, I always end up using the same traditional colors. My children love it and that is the most important thing. Your tree pictures with the lights turned out awesome!